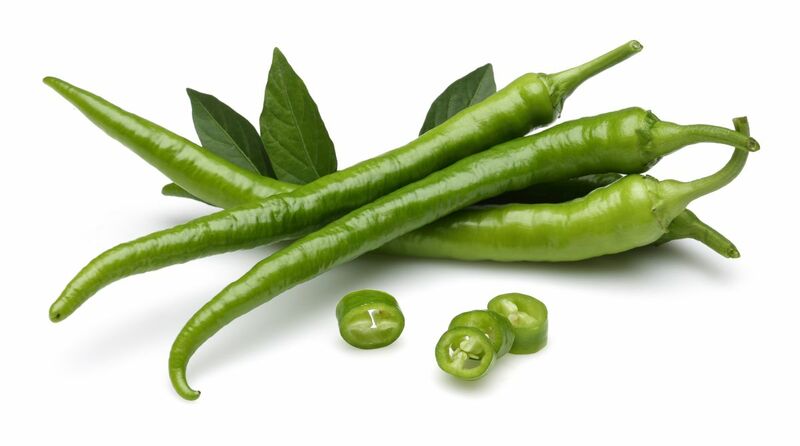 Green chillies are a small, fiery variety of capsicum. There are more than 100 known varieties and they differ greatly in size, colour and level of hotness. In general the smaller the green chillies, the more potent they are, but it is worth mentioning that individual chillies of the same variety and even from the same plant can contain different levels of capsaicin, the volatile oil that gives green chilli its heat. Green chillies work well in savoury dishes. A little can help to cut through the richness of sweet dishes. The seeds and flesh of green chillies can both be eaten. While using them in cooking, their heat or intensity of capsaicin does not reduce, it can be reduced only by removing the seeds and veins. Wash them before using and cut off the stem. Avoid contact with eyes or any sensitive skin during or after preparing green chillies – even washing your hands afterwards may not be enough to remove all the capsaicin. Buying: Green chillies are available fresh in supermarkets. When shopping for more interesting varieties, farmer’s markets are the best hunting grounds. Look for a smooth, glossy skin that is deep green in colour and firm to the touch. Discard any chilies with shrivelled skin, brown marks or watery bruises. Storage: Green chillies in prime condition can be stored for a week or two in a ventilated plastic bag in the fridge. Chilling affects the flavour, so bring them to room temperature before use. Rich in dietary fiber: Fiber is an important component for a healthy digestive system, and green chillies are loaded with it. Consuming green chillies can help in the digestion process. Chewing green chillies also releases saliva in mouth. Foods that release saliva while chewing also help in proper digestion of food. Thus eating green chillies aids in this process well. Combat increase in sugar levels: Green chillies should be included in the diet of diabetics because they can decrease the sugar level in the body and further help by creating a balance. Burn excess fat: Green chillies increase the metabolism of the body. Therefore they help in burning excess fat and reducing weight. Rich in vitamin C: Vitamin c keeps your skin in healthy state and makes it radiant. Being rich in vitamin C content, green chillies can help in your healthy skin care regime. Cooling effect on body: After consuming green chillies, our body releases sweat and sweating has a cooling effect on the body. Thus green chillies are consumed in abundance in hot and humid areas. Beneficial to respiratory system: Being loaded with phytonutrients, green chillies keep the respiratory tract clean and prevent many lung problems, such as cough, cold and asthma. It can also combat lung cancer. Anti-inflammatory: The anti-inflammatory properties of green chillies help in relieving the pain and swelling that occur due to arthritis, osteoarthritis and rheumatoid etc. Good for teeth and bones: Surprisingly, green chillies are the finest source of calcium. So incorporate them in your diet to keep your teeth and bones strong and healthy. Also they do help in tissue repair and creating new blood cells. Build up immunity: Vitamin B6 and C components present in green chillies boost body’s immunity to fight against various diseases. Benefits of vitamin A: Being rich in vitamin A, green chillies help in improving vision and reduce the risk of eye problems like cataracts and macular degeneration which happen due to age factor. Act as anti-depressant: The capsaicin present in green chillies help you keeping in good mood by relaxing the ‘feel good’ endorphins. Good for hair health: Green chillies contain vitamin C in abundance. Vitamin C helps in absorbing iron and providing oxygen to hair. This consumption prevents split ends and hair breakage. Also green chillies improve blood circulation to scalp and hair follicles and work as a growth stimulator. With so many benefits, keep in mind to consume them in moderation. Consumption in excess can cause mouth, stomach and skin irritation or pain. Wash your hands twice or thrice after handling green chillies in any ways. Do not touch your eyes, nose, mouth or other sensitive body parts after handling green chillies even if you have washed hands properly. Sometimes due to the high amount of capsaicin, the heat still remains in hands even after washing them many times. So be very cautious! Green chillies are a good taste enhancer and are used as a seasoning in every Indian dish. It is not only an essential ingredient in every Indian household, but it is an integral part of Mexican and Thai cuisines as well. Not many know that India is the largest consumer, producer and exporter of green chillies in the world. You can use this hot and steamy condiment by slicing, chopping, slitting or dicing it. Add it to any dish mixing with other ingredients or just garnish your food with them. Enjoy these hot greens in a healthy way!